TK Products TK-290 WB is a Water-based, low VOC Water and Salt repellent for concrete, bricks, and pavers for use in light commercial environments. 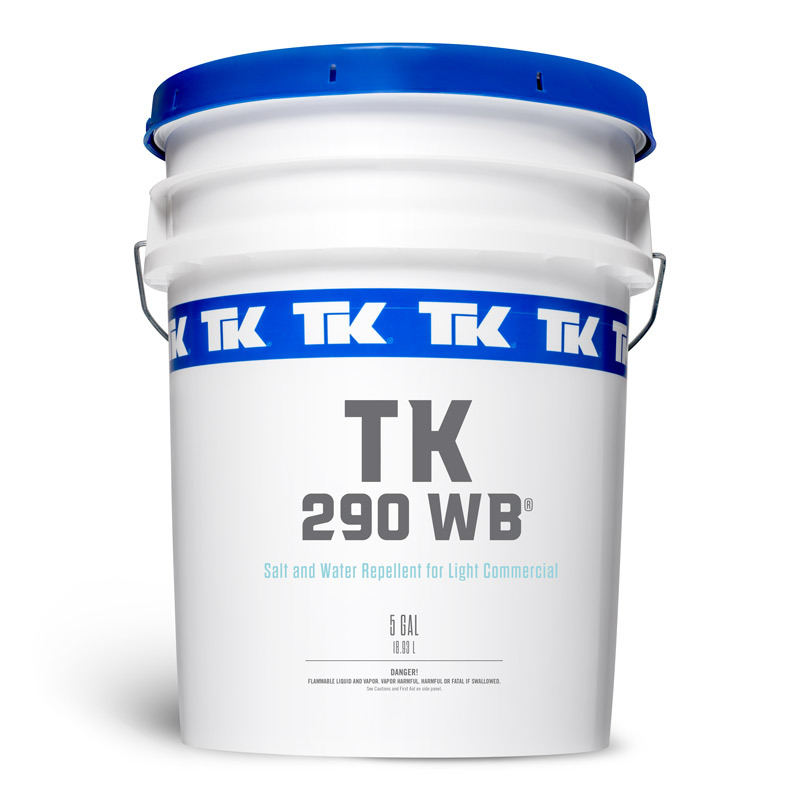 TK-290 WB™ has excellent penetration to help protect against damage caused by freeze-thaw conditions and environments where salt is present. 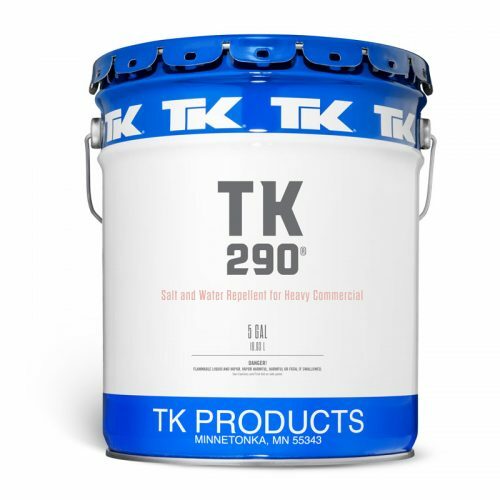 TK-290 WB is a waterborne silane/siloxane, multi-substrate, salt, and water repellent. Engineered to prevent damage from environmental conditions including de-icing agents, salts, freeze damage, efflorescence, scaling, surface popping, and the damaging effects of acid rain. TK-290 WB is formulated to penetrate up to 1/8 inch (3.175 mm) and chemically bond with the substrate to become a permanent part, prohibiting salt, water, and chloride ion intrusion. This protection ensures the longest life-cycle to the substrate by preventing surface deterioration. 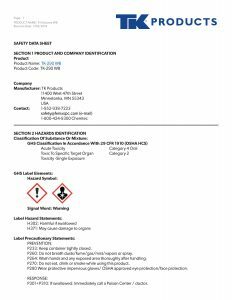 Before using this product, read the Safety Data Sheet for complete safety information. All surfaces to be treated must be clean and structurally sound. Thoroughly clean surfaces to remove all grease, oils, form oils, or other contaminants. 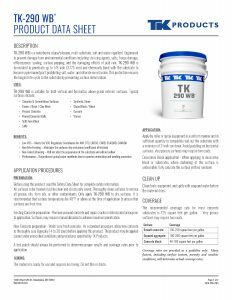 Only apply TK-290 WB to dry surfaces. It is recommended that surface temperatures be 40°F or above at the time of application to ensure that surfaces are frost-free. Remove unsound concrete and repair cracks or deteriorated areas prior to application. Surfaces may require manual abrasion to achieve maximum penetration. Water cure fresh concrete. As a standard procedure, allow new concrete to thoroughly cure (typically 14 to 28 days) before applying this product. 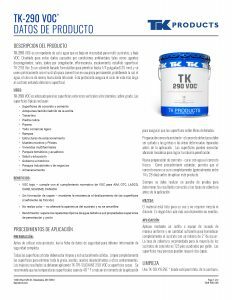 The product may be applied sooner under prescribed conditions and procedures specified by TK Products. A test patch should always be performed to determine proper results and coverage rates prior to application. 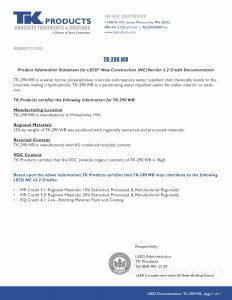 The material is ready for use and requires no mixing. Do not thin or dilute. Apply by roller or spray equipment in a uniform manner and in sufficient quantity to completely wet out the substrate with a minimum of 2-inch run down. Avoid puddling on horizontal surfaces. Very porous surfaces may require two coats. When applying to decorative block or substrates where darkening of the surface is undesirable, fully saturate the surface with no rundown. Coverage rates are provided as a guideline only. Many factors, including surface texture, porosity and weather conditions, will determine actual coverage rates.